Welcome to the April update of your favourite project collaboration system! Let's talk about busy projects, how they get overloaded with content quickly, and how sometimes the usual hierarchy that sees tasks and subtasks in task lists, and lists linked to their milestones can still be not enough. Today we introduce the ability to tag all tasks in Apollo. You'll be able to apply one or more labels to tasks in a way that make sense to you and your teammates. For example, instead of "#review_before_end_of_year" you can write "Review before year's end" or "Review / 2019". The most common scenario for tags is to add more context to a task. For example bug or call, or the name of a place if the task can only take place at a specific location. We advice you against using tags in place of other fields that are already present in Apollo, such as the Priority of the task or the assigned person. Don't be the guy that tags tasks as high priority when there's already a Priority field available! No tagging system would be useful without filtering, and Apollo has got you covered. 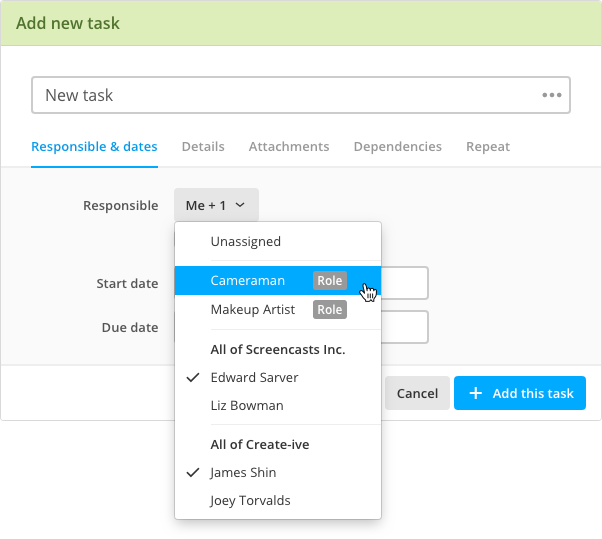 Once you start using tags on tasks, the filtering system will show handy controls to see only tasks with the tags you specify. Working on a team means that different team members could think of a different tag name for the same concept. Add that for every project and you'll quickly end up with an unmanageable tag cloud, or with tags that don't make any sense in the current project. That's why tags are siloed into each project at first – a tag added to a project task will only be available for tasks into the same project. If you want a tag to be available globally, just make sure you have the ability to edit other user's stuff (or ask the workspace owner) then head to Settings → Tag management and click Task tags (only needed if you have ability to track contacts and leads). Click on a tag and select Make this a global tag. This mixed approach should bring together the best of the two worlds, giving you the freedom to create all the tag noise you need in a specific project, but also the ability to curate a clean set of global tags over time. Duplicate the project, do your stuff, and if you're not happy with the result, just delete the project copy and go back to the original one. Not everybody likes project templates, just like not everybody likes coffee, or Nutella, or pizza. Just make a copy of a project to use it as a starting point whenever you want. And yes, actually everybody likes pizza! Although Apollo offers revision history for project items, sometimes you might want to keep track of what the project was at a certain date, as a whole. 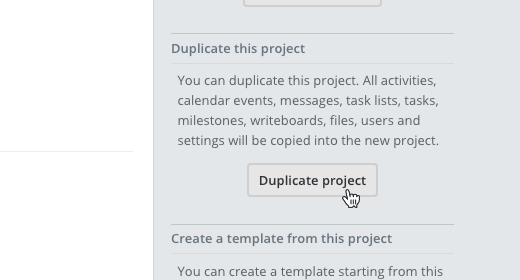 By duplicating it, and removing other users from the duplicated project if necessary, you can do it! Projects grow, scope creep is behind the corner, more people join in, things get complicated fast. Split the messy project into two more manageable ones, by duplicating it and deleting unwanted data from both. It will be easier on the mind and on the eyes. There are a lot more use cases emerged from your feedback. They range from meh to that's legit, to why isn't the feature there already? – they all contribute to Apollo, so keep your feedback coming! 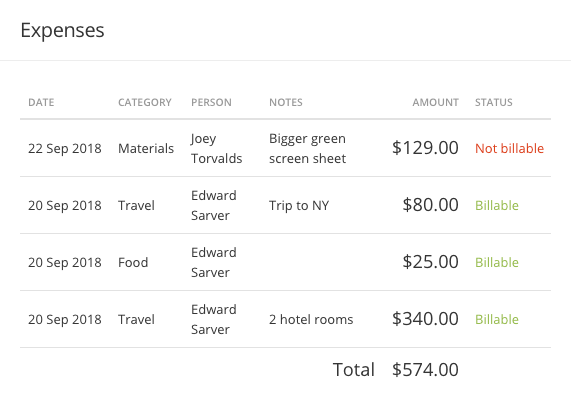 Project activity sometimes didn't load if there were items regarding project expenses. 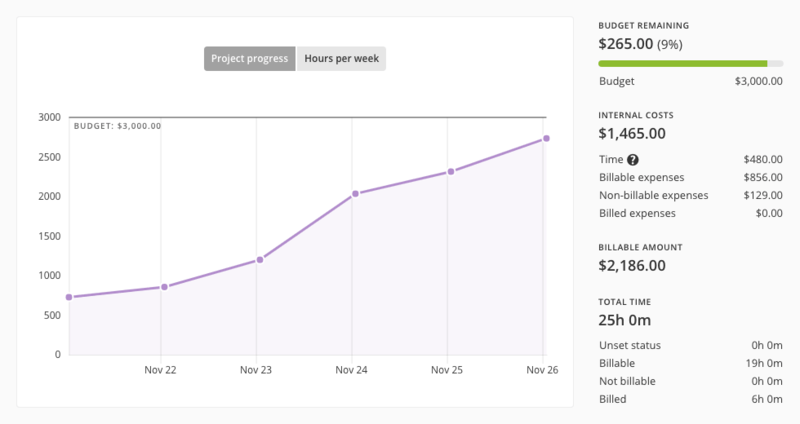 Estimated time in the project overview was visible to users that weren't allowed to see it. Mobile: editing a timer description wasn't saving on first try. 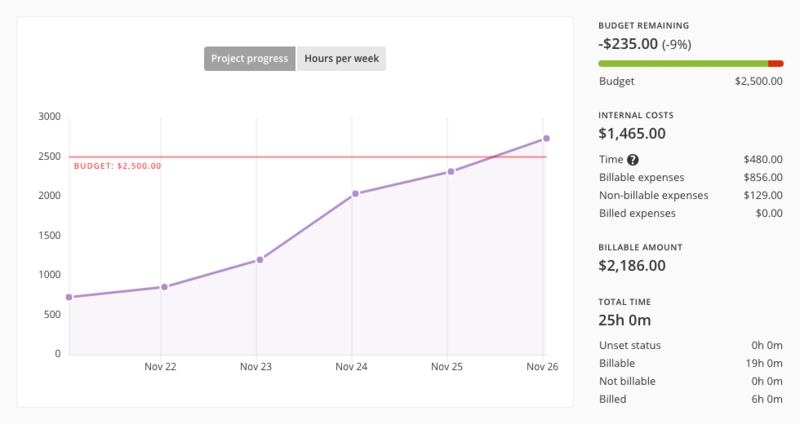 We hope you're enjoying the Budget tracking feature we released last month. The response and appreciation from our users was overwhelming, and for good reason! It's a tool that you don't even need to actively use; just set it up and glance at it from time to time to make sure your budget is below the limit line – or be notified when it reaches a specific threshold. Speaking of user response, your feedback spurred some interesting ideas, one of which is today's new feature. 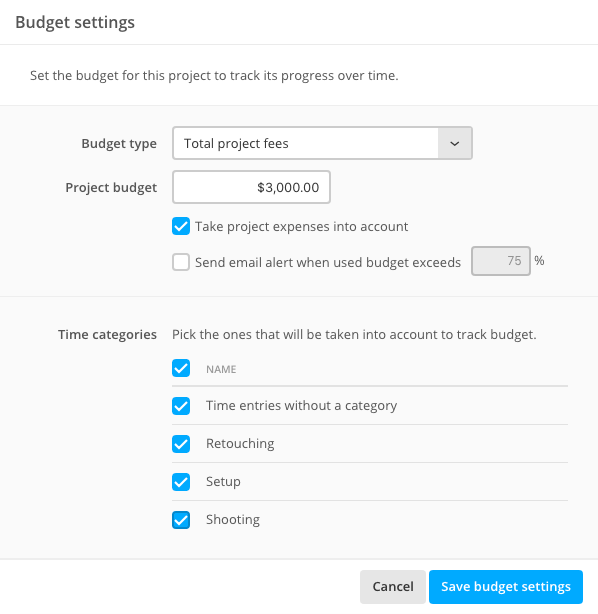 As mentioned in the last post, the Budget tracking section was only available to internal users with the “Can manage projects” permission, which somewhat limited its usefulness to the team. Starting today tough, you have the ability to specify the Budget access level for each user, on a project by project basis. To do so, click the People and Permissions menu in a project and select the access level for each user. Access levels are simple and self explanatory: “no access” means that the user won't be able to see or access the Budget submenu at all; “can see” means that the user can access the Budget screen but cannot mess with it; the last one gives full access instead. 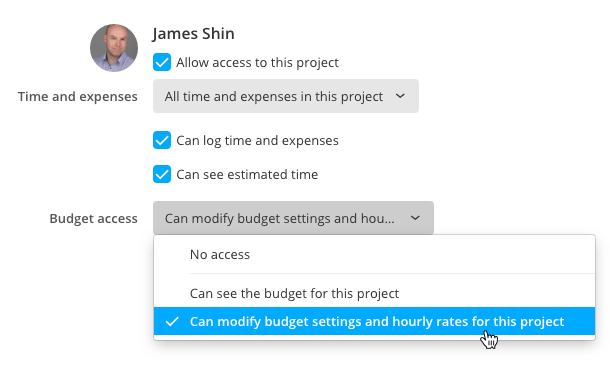 All users that could already access the Budget feature (because they had the “Can manage projects” permission) have already been granted the highest permission, so this additional flexibility in the permissions does not get in the way of your daily activities. That's all for 2018. Merry Christmas and Happy New Year! Set a more readable link color in corner notifications. The task form was not allowing the due time to be before than the start time, even when the due date was later than the start date (e.g. : starts today at 8pm, ends tomorrow at 6am). The link for refreshing a project tab in a notification was instead showing the Overview. The summer is getting hotter and hotter in our hemisphere but that doesn't prevent us from keep building Apollo! For those that are waiting for it, we are almost done with the Budget management features for projects, and users in the Brave Collective will be able to start playing with it soon! Now back to today's new feature! As it's often the case in teams of any size, project timelines are adjusted and people assigned to one project are moved to another. After shuffling teams to different projects, however, any project item responsibility assigned to a user needs to be reassigned by hand. Select the current responsible on the left, the new responsible on the right, choose to reassign Tasks or Milestones (or both) and submit. Done! Here's a handy tip for project managers that already leverage Project templates: suppose you have a template with accurately chosen timing and sorting for Tasklists, Tasks, Subtasks and Milestones, for which responsibles are chosen only when actually starting the project. The normal way of assigning responsibles to those items would be doing it manually after adding users as members of the project. Instead, we suggest you create some fake users called, say, Generic Designer, Generic developer 1, Generic developer 2, and so on – users are unlimited in any Apollo plan – add those users as members of the Project template and assign them tasks and milestones, then create your project using the template and simply reassign all items using the Item reassignment feature. While we're hard at work to bring you the Apollo Mobile native apps, we're still happy to satisfy all your requests for the current web version. A few users lamented the lack of the Project activity feed, that is very useful to see at a glance what happened lately in a project when you are on the go. So we went ahead and added it! And that is all for today, thanks for reading! Import template into project: selecting a template with tasks having a due date relative to the project due date is not allowed anymore if the destination project doesn't have a due date set. Added spacing to Tasks in My completed Tasks, that were not rendered correctly. Keyboard navigation was breaking when focusing the select boxes in the Time log or Task picker forms. The Google Drive or Dropbox authentication windows would not close after a successful connection, and Apollo had to be reloaded to start using those services. This week we show you a new feature that just landed in Apollo and also we update you about our efforts to be compliant with the GDPR (General Data Protection Regulation). Let's dive in! 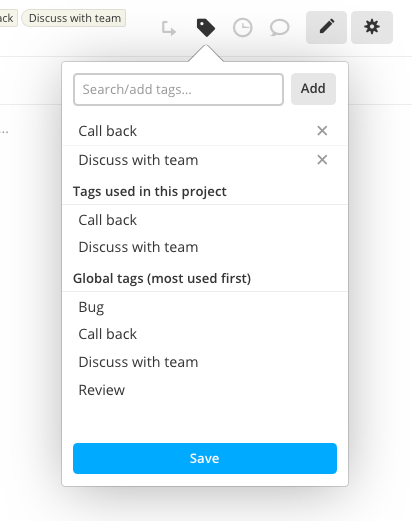 This new feature has been requested quite a lot lately, in particular by teams that have more than a few people collaborating in a project at the same time. Especially when external users are involved in the project as well – like the customer, for example – it can be difficult for project members to know who to assign a task by looking at a dozen or more available options. You add roles by going to the Roles page for a project. After defining a role, you just add users one by one. You can mix internal and external users, of course, and assign one user to multiple roles as well. 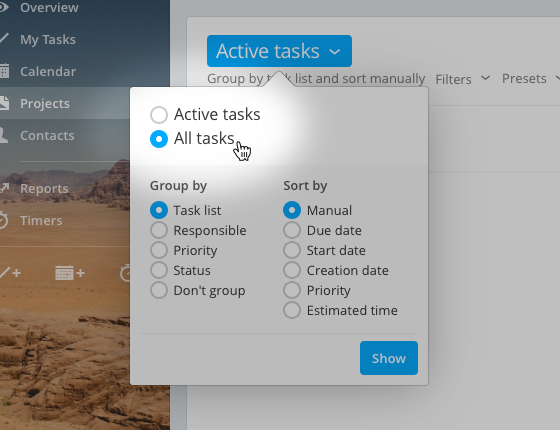 And here's how simply is to select multiple responsibles for a task now. 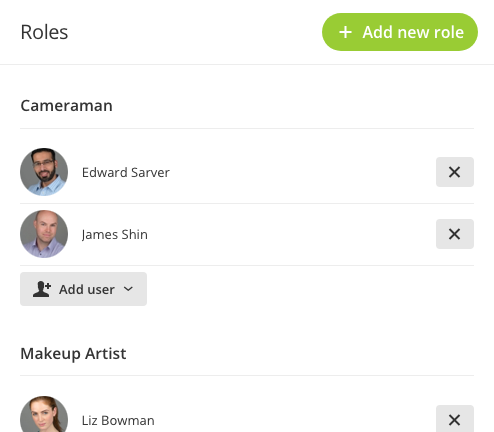 Just click the role name and the all project members with that role assigned will be selected instantly! Of course, moving users to a different role will not mess with tasks already assigned to them. In the last months we also worked to ensure we were ready for the GDPR. By now, you should have received a huge number of GDPR related emails, so we can spare you the lecture about the new European law that comes into effect next Friday. If you want to know more, see the official resource on EUR LEX. Updated our internal data management and data retention policies, expecially for data backups and made sure that everything is encrypted at rest. Reviewed and updated all our internal tools and dashboards, and made sure the displayed information is adequate, relevant and limited to what is necessary in relation to the purposes for which they are processed. Vetted all subprocessors that handle our customers' personal data to ensure they respect the security and privacy standard under the GDPR. Reviewed our data export options to make sure that the account owner can export all data in a structured, commonly used and machine-readable format (XML) anytime. API: You can now retrieve projects that have been archived. Project templates: Milestone's due dates can now be set to more than 52 weeks. Clicking below the "11:00 PM" line on the calendar week view wasn't showing the form for creating a new event. Enabling the "Shift subtask date" option when editing a task with subtasks would only shift direct-child subtasks. Contacts: trying to add a note with visibility to specific people would show an error if there was actually no people selected. Summer is coming – at least in this hemisphere, sorry south fellas – and even though the urge to enjoy the beach is ever growing, we keep hammering at the keyboards to bring you new features every week! This time we thought to simplify access to Apollo's ever growing list of project features. As you already know, each Project relates to a slew of elements, such as Tasks, Messages, Files and so on. Each of these element types gets its own section in the Project's main menu. This is a great way to make the Project look less cluttered, and lower the learning curve for your clients and, in general, less experienced users. 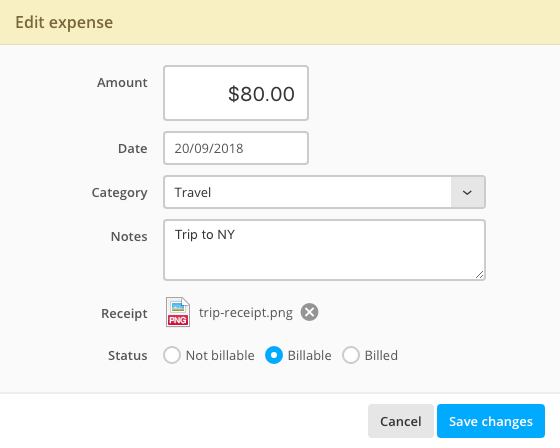 This feature will make even more sense in the following weeks, when we plan to release *hint hint* the ability to set the Project budget, along with the that to store the Project expenses. Here's a reminder that you, as an active user, are able to vote for your favorite upcoming Apollo feature. Just head to the Feature polls page, log in with your account and start voting. That's all, folks. Thanks for reading! 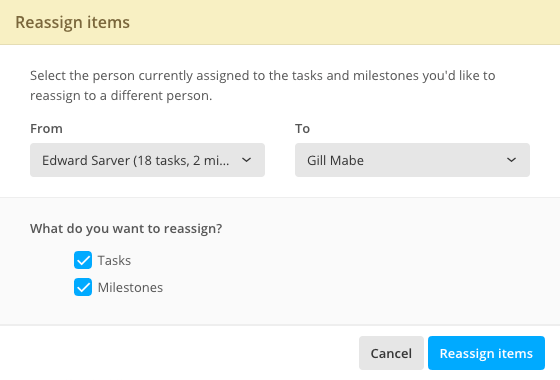 Added ability to set a start date to Tasks in Task list templates. Added paginator to the ‘Milestones across all your projects’ page. API: some workspaces weren't able to add or modify calendar events. In some cases, attachments to a Personal task or to a comment on a Personal task weren't visible to users outside the Task owner. Edit task form: the start date couldn't be removed once set. Body content sent in HTML format using the email dropbox feature was not sanitized properly in some cases. We heard what you just said after reading the subject above, because it was a massive, resounding and well deserved finally. That's true, Gantt charts have landed in Apollo. Now it'll be much easier to see how project tasks relates to each other over the timeline, and make the appropriate adjustments on the fly by dragging them around! 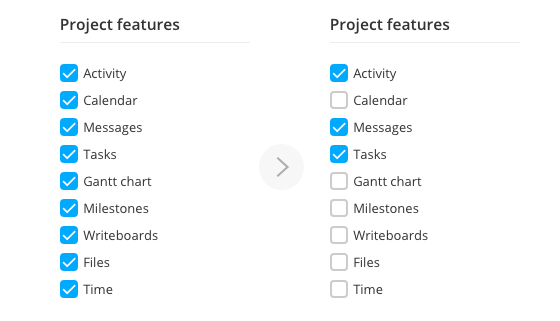 On the left side you'll find a hierarchy from Project to Milestone to Lists to Tasks and subtasks, and you'll be able to compress parts of that tree using the +/- icon to focus only on what you need. Even though changes made to Tasks while using the Gantt chart are instantly saved on our end, we do keep track of them so you can undo them via the Undo button. Like every feature in Apollo, the Gantt chart is going to improve over time thanks to your suggestions, so drop us a line to let us know your thoughts. Read-only Google Drive files in Apollo were not allowed to be selected. Apollo wasn't reloading after linking a third party storage account like Dropbox or Google Drive. In some cases, a Subtask added from the parent Task detail page would not appear in the right Task list until Apollo was reloaded. Sometimes, adding or deleting a Subtask would not refresh the user interface. Converting a project to a template was skipping the project's file folders. The task picker dialog for attaching a Task to a Timer wasn't showing the real status of each Task. API: Contact tasks were being added without assigning the specified responsible.